Snack time” at school was designed to feed young bodies and brains. But too often, it’s just code for candy, chips and other snacks that are full of sugar, salt, and fats. Enter an all-natural, technological innovation in the kids’ snack category: Healthy Munchy Fruit Crispies. This is a truly nutritious treat with the sweetnes, and satisfying crunch that kids crave in snacks. 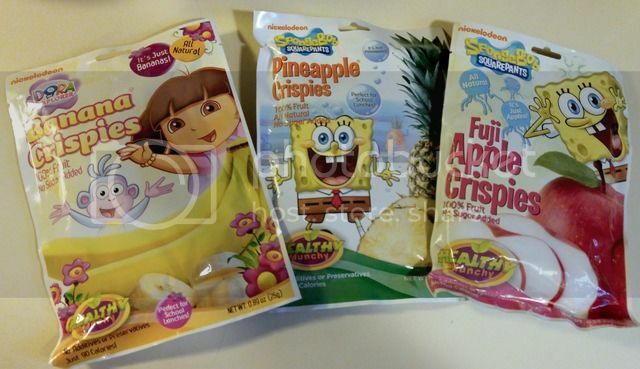 Each individual bag features some of kids’ favorite licensed Nickelodeon characters like Spongebob Squarepants or Dora the Explorer, so it’s as fun on the outside as it is flavorful and healthy on the inside. No salt, no added sugar, just pure delicious fruit. Super filling – one bag of Fuji apple crispies equals 2.2 apples! Say goodbye to chips, cookies and other caloric, sugary, salty snacks that often find their way into lunchboxes, and tempt in vending machines.Each bag contains a low calorie (up to 90), filling serving of 100% fruit crispies, made from nothing but picked in season fresh Fuji apples, pineapples, or bananas that are freeze-dried using a technology that removes moisture but retains nutrients and yields a delicious crunchy texture. 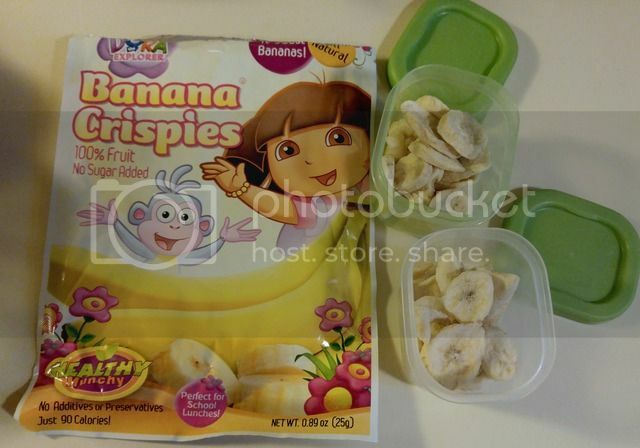 Available in three different flavors: Dora the Explorer pineapple; Spongebob Squarepants Fuji apple, and Dora the Explorer banana. Individually packaged single servings are easy to stash in lunch boxes, but I actually split them into two plastic containers for lunches (one for each child). We love that they are so convenient and great to have hand when you don't have fresh fruit in the house. Your kids will think they are getting a treat, while we parents know they ate getting 100% real fruit! These are perfect for school lunches, either send the pack with the kids or open and place in a reusable container! These are now available October 1 at Fred’s, 99 Cents Only Stores, as well as at www.healthymunchy.com for $1.49 per pouch.